The traditional office layout with the stereotypical cubicle, stark white walls, and harsh florescent lights are becoming outdated and unpopular. More collaborative spaces, benching designs, and glass walls are the common choices for a loft layout. These creatively flexible office designs are the emerging office trends. A loft layout is perfect for any business to renovate to best serve the employees. The space is designed to be the most efficient and effective. Architects and designers are now intentionally highlighting the industrial character of the space. Many designs will maintain the firewall, but not with plaster instead exposing the masonry and pipes. The lighting and flooring are industrial to maintain the aesthetic. When designers are arranging the interior office space, the design tend to be more contemporary and modern. 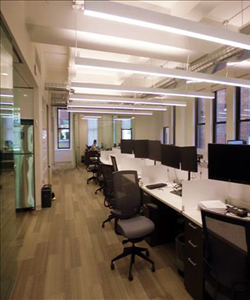 Office spaces are moving towards an open area with benching workstations, a wide aisle, and varying designs for different areas. A major consideration to this open design is the encouragement of physical activity among other departments. Another factor is communication and teamwork between colleagues. Many businesses are including more comfortable seating areas, breakout rooms, and sofa seating to encourage informal meeting areas. For formal meeting spaces, glass-enclosed conference rooms are a common design choice to open up the space. Many conference rooms include equipment for media presentations and video conferencing. The boost in demand for loft layouts is a result of rising real estate cost. Businesses are buying and leasing smaller spaces while maintaining or increasing the staff. While the positives and negatives of open layout are continually in discussion, a major bonus is the mobility afforded to employees now. Employees have more opportunity to engage and work beyond their workstation. The mixture of work culture and efficient workspace have become more planned and thought-out in the previous years. The office space is becoming for enjoyable for employees. The décor now resembles more residential furniture pieces, energetic colors, and a more casual atmosphere. Many elements are influenced by coffee shops and lofts to manage employee’s engagement. Loft layouts are focusing on giving employees the space they need to get the job done. It should be stated that not only do commerical lofts service the office sector but also provide a home for many showrooms and have traditionally played host to fashion and design over the course of the city's history. Many of the lofts that exist in the Garment District today still contain showrooms and in some cases there is even a building or two in the city that only leases to fashion / design clients exclusively. Though manufacturing rarely is housed in such spaces today - most of which have moved their operations away from Manhattan for larger spaces coupled by lower rental rates. If your business is relocating or looking to move, consider the way the space is functioning and ways to improve productivity. We are ready to assist in your search for the right office loft. 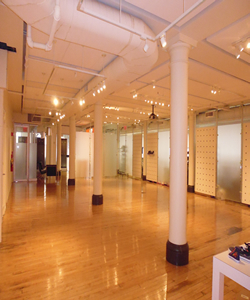 Contact us to tour any available office lofts in New York City at no obligation or fee.